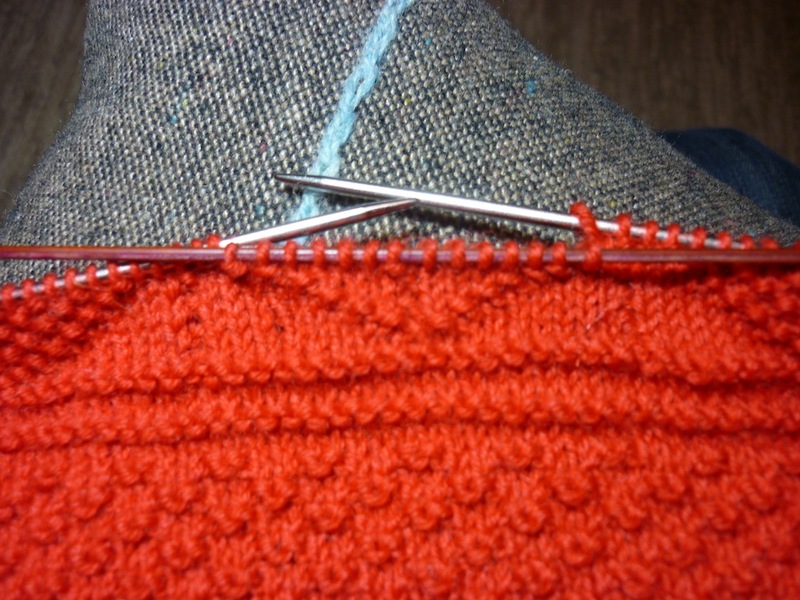 Instead of using long DPN’s I find that using two circular needles, ie knitting off one onto another, makes it easier to move the tight stitches along. I also use this method for circular shawls. I find it less hard on my hands. 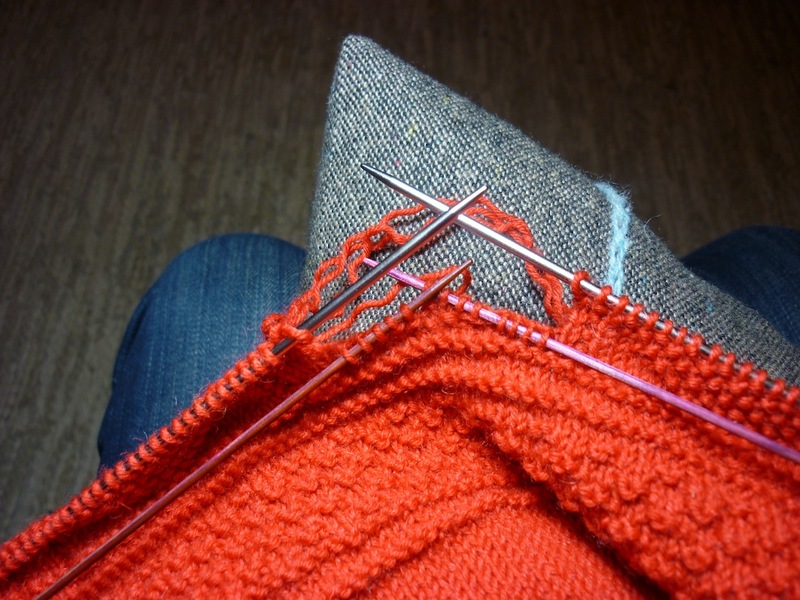 I tried that as well, and did find it a little bit easier, but once one needle was broken, I couldn’t continue that way… In any case, I’m just curious about using those long DPNs and a knitting belt or sheath, as apparently it makes for really fast knitting. YMMV, but steeks aren’t necessarily going to work in a gansey. A gansey yarn is smooth and worsted spun – brilliant for unpicking to reknit (mistakes or worn out sleeves) but not good for cutting steeks. You’d have to stitch it so firmly to prevent rows popping out and unravelling that you’d end up with a very bulky edge to your armholes. And ganseys are supposed to be formfitting and activewear – again, rather more stress on an armhole than on a looser, ‘woollier’ garment. Just my thoughts. 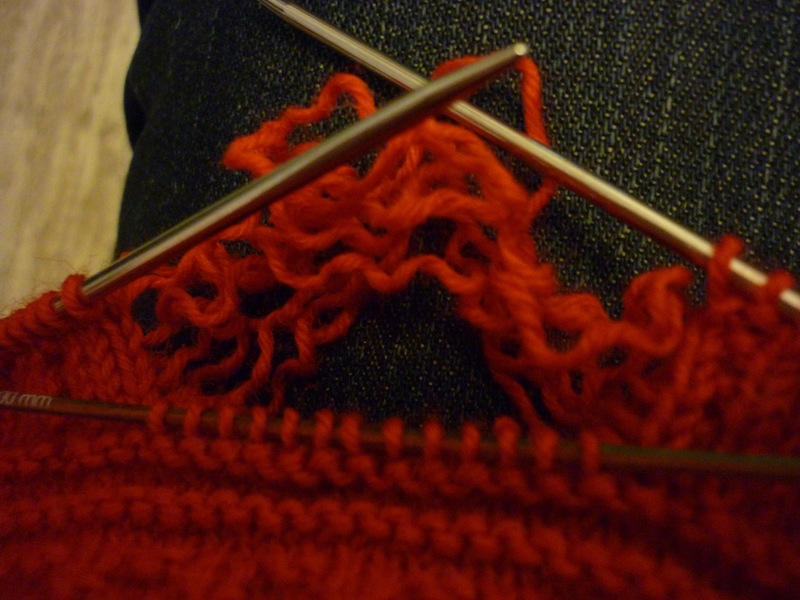 If the original gansey knitters had thought steeks would work, I’m sure they’d have used them. The knitting would be MUCH easier. According to Mary Wright in Cornish Guernseys and Knit-Frocks, in the Channel Islands the ‘original gansey knitters’ did the following: [traditionally the body fabric is worked in the round to the shoulder level. 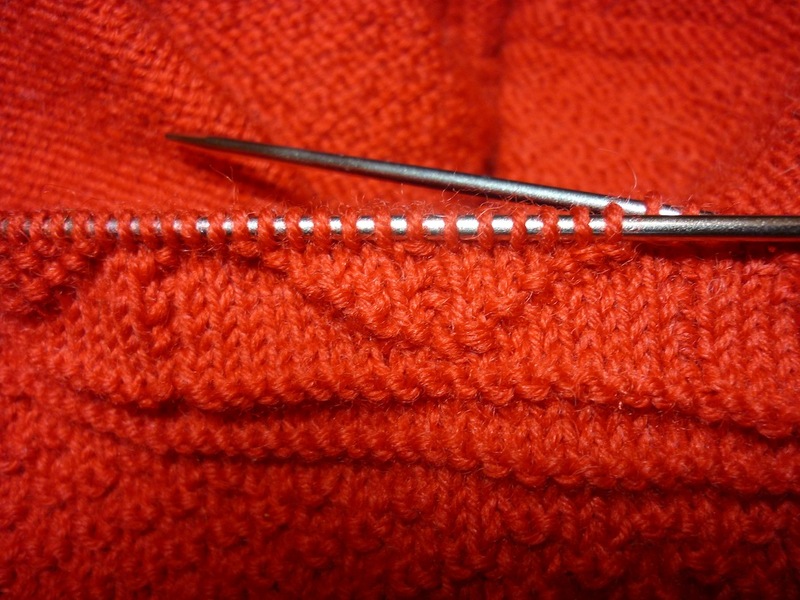 Knitted stitches are then cut to form the armhole, and the sleeves are knitted from the cuff and sewn into the armhole.] (pg 62 of my 2008 edition). Why this method was never adapted elsewhere where they made similar garments from similar yarn, we will perhaps never know. I have an interest in historical techniques and patterns, and I like to let these inform my knitting. However, I don’t want them to restrict my knitting. So eventhough I can actually find a historically accurate reason to try a steek, I came to this from a more practical point of view (I had actually forgotten about what Wright had written until your comment triggered my memory): I will never be wearing the gansey in the same circumstances as a fisherman and would probably never put the same stress on the shoulder seams. Also, I found in my (it has to be said, limited) experience of gansey knitting the gauge so tight that I’m not too afraid of rows popping out, even if I do use a worsted spun yarn. That said, I will definitely try it out on a swatch before starting the adventure. As you say, a worsted 5-ply is very different from a Shetland woollen spun! And there’s always this method to try: http://textisles.com/2011/11/27/wool-worn/ In any case, whether a steek will work or not, I shall report back in due course! I’m almost finished my jumper, and you are welcome to borrow my set of 40cm dpn’s I’m trying to finish by New Years. Thanks very much for the offer Jake. However, I have since found some 2.25mm 40cm long DPNs in the bag of knitting needles left by my granny. I only just recently found out they contained a complete set. What did you think of knitting with such long DPNs?